Phew, that is over. As much as I love the success of our conferences at the day job, they are a bit exhausting. I end up with very little time to read. I need to have a new resolution for next year--find more time to read and find someone who will pay me to do so. I am unfortunately going to fall short on my reading goal of 75 books as well this year. Plus side to this, promotion at work is what is eating up my time. This week, back to Netgalley for some of my standard fair--epic fantasy!! I got an email from Netgalley about a great new Young Adult writer who is going to compete with the big dogs of epic fantasy. After reading this novel, I believe they got it right. 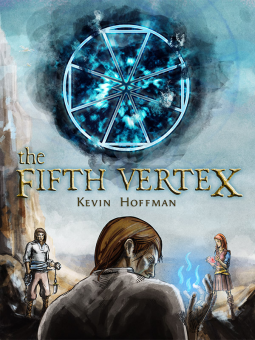 I would easily give The Fifth Vertex 5 stars based on its writing and fantasy creation. This is a great fantasy novel with some seriously awesome magic. You don't see the standard elf/dwarf/magician dynamic in this story and that is refreshing in itself, but what I absolutely love about the story is the global span. You have cultures that clearly never leave their little spheres suddenly crushed together and having to get along. They need to determine where to lay their trust amongst betrayal and deception. These are also not races of the dark ages with nothing but stick huts and horses that are found in your typical epic fantasy. Hoffman has broken out of the box to find interest for the modern Young Adult fantasy enthusiast. The races he created have technologies--really cool technologies: wind cloaks, submarines, and siege towers from hell. I appreciated the growth of the main protagonist, Urus Noellor. This is clearly a coming-of-age story being in the Young Adult category, but it had a fresh feel. He is learning his magic with no help from anyone and completely (realistically) scared out of his wits about what the magic could do to him and those around him. He is also deaf, which puts a wrench in anyone teaching him and a new meaning to isolation. While at the same time, we get to see the development of Cailix in her magic via tutors--deranged, frightening tutors, but at least she has someone to teach her. Hoffman is uniquely showing us both sides of the coin. The antagonists of the story are appropriately creepy and villainous. They are truly disgusting. There are multiple types of magic and each is very well developed in the story. I never really felt lost for character abilities. The mystery of what we don't know struck my curiosity, not my frustration--love. This book has all the great epic fantasy aspects. I am really looking forward to The Blood Sigil. A sad fact that seems to becoming more of my reality--I am not happy with where modern literature is going. This fact did not completely detract from my enjoyment of the story and it certainly cannot reflect on the magnitude of awesome that is The Fifth Vertex. Fortunately for me, there are still plenty of classic pieces of literature out there that I have not read to give me relief between struggling with adapting to modern literature. To keep up-to-date with The Sigilord Chronicles visit Kevin Hoffman's website, his Facebook page, or follow him on Twitter.